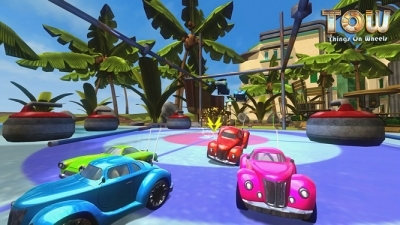 Things on Wheels, the crazy racing game, is now available on Xbox LIVE Arcade! Right now, enjoy fierce races on Things on Wheels for only 800 MS Points. To celebrate this release fittingly, we are pleased to reveal a little more of this incredible racing game via this video that perfectly captures the spirit of Things on Wheels: crazy, fast and fun races! Drive a multitude of miniature racers with various features – light Vintage cars, powerful Muscle cars or fast sports cars – and compete in dozens of crazy races. The tracks are completely insane, loaded with shortcuts, ramps, loops and many other surprises. Count on a lot of collectable bonus items to spice up the races even more and upset the final rankings! Play single or multiplayer on Xbox LIVE, in intense races to reach the first place of the official rankings. Things on Wheels is THE racing game you don't want to miss on Xbox LIVE Arcade. Things on Wheels will be available May 12th 2010 on Xbox LIVE Arcade.